Some of owner and flower expert Laurie "Fleurie" Garza's bouquet designs. Photo courtesy of Ellie Koleen. Courtesy of Erica Houck Photography. Photo courtesy of Ellie Koleen. Photo courtesy of Laurie Garza. Photo courtesy of Lauren Garza. Laurie "Fleurie" Garza. Photo courtesy of Lauren Garza. Owner and flower expert Laurie "Fleurie" Garza has been a successful part of the Central California community since the opening of her lovely Fleurie Flower Studio in 2010. Garza has always known that using flowers in creative ways is what she wanted to do. One of her main goals is to not only create lovely, hand-crafted bouquets and designs, but to use as locally-sourced flowers as possible. Read on to hear her inspiring and interesting story in the flower business. Tell me about Fleurie Flower Studio. How did it get started? 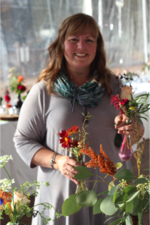 Fleurie started officially in 2010, after a long career in the retail nursery industry, teaching Floral Design at Reedley College, and employment in 3 flower shops over the course of 30+ years. I really wanted to do my own thing, promote my own brand and style, and get out of the retail environment. Working for myself was the best option. I not only chose flowers and plants as a career, but it is my hobby as well, it’s what I do in my spare time too, so it was a natural transition. What should we know about working with Fleurie? I am not a retail store, I have a private studio at my home, so I do not accept clients there, unless it is to pick up an order. Since I am a studio based floral designer, I don’t keep flowers and plants on hand, it is all ordered in special when a client has a request. What's one of the most memorable moments from working at Fleurie? Really, each wedding is memorable to me for many different reasons. It’s a very sacred day, and I take it as such. The client has chosen me to participate by adding the beauty of flowers to their special day, and that is so flattering to me. Every wedding or event gets my hands on it, because that is what feels best to me. Larger events of course take more hands to complete, and I have flower friends that I call upon when needed. I love the idea of being a ‘family florist’ someone who a family calls on for all their life’s events- happy or sad. Are there any upcoming events that we should know about? One item of note upcoming is a feature in a printed magazine, of a photoshoot that I worked on with an awesome team of vendors from Fresno, Palm Springs and Orange County. 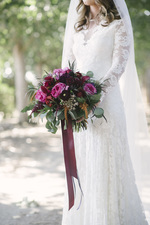 We created an ethereal wedding inspiration shoot in an almond orchard in early spring of 2016. Waiting for that feature to come out, and not sharing all the wonderful photos of what the team created is so difficult! Any time a photographer can accurately capture the true look of my work is always special, and this one is no exception! What type of bouquet is "in" this season? The most popular bridal bouquet request in the last two seasons is a larger size bouquet that has a lot of different types of greenery, along with garden roses and other flowers looking like they came from ‘the garden’. It is just my kind of style, since I grow many varieties of flowers for my business in the garden at my home. One of my favorite things is to be able to say: I grew that! I strive to be able to create arrangements from my garden, it so rewarding. When a client says: "I love your work- you do what you do, I know it will be awesome." I love it when the client has that trust in my design and my extensive experience in the industry, and they are able to let go and let me create. Like most creatives, I am most happy with the results when it is a natural reflection of me. That being said, I do love a good challenge, maybe a type of design style that I don’t get to do often, or a unique theme for a party or event. I am up for it! Being creative is the best thing! To learn more about Fleurie Flower Studio, visit the website here. Photos courtesy of Erica Houck Photography, Ellie Koleen, Lauren Garza, and Laurie Garza.